"By the pricking of my thumbs, something wicked this way comes". 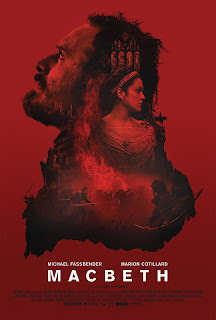 Justin Kurzel's Macbeth is a simply astounding piece of film making. It tackles an undeniably epic story, and one told through cinema many times before, but in such an innovative and invigorating way. I have to come clean from the offset, this is the first form of the Macbeth tragedy I have experienced. I have not seen any other film adaptations, read the play or seen a theatre production. This was my first time to see and appreciate Macbeth. But if any other version of this story is as mesmerising, powerful and downright bloody brilliant as this, then I will not be stopping here. Kurzel's Macbeth is bold, it is loud but also subtle, enormous but also intimate, violent but also delicate. Quite simply, it is one of the best reasons to be excited about film in 2015. After defeating a traitorous army, Macbeth (Michael Fassbender) is prophesied to become King of Scotland by three witches he comes across in the battlefield. Obsessed by this prophecy and bound by ambition and desire, yet harboring doubt and uncertainty, he is ultimately convinced by his wife Lady Macbeth (Marion Cotillard) to slay the current King. After the King's heir flees the country in fear of his own murder, Macbeth takes the crown for himself, fulfilling the prophecy but at the expense of his humanity. At least I think so, in all honesty this film is so brutal and compelling and frightening, when it's your first time watching this story unfold it's next to impossible to take everything in. Macbeth is one of those films that demands repeated viewings, especially for those unfamiliar with the source material. If, like me, you see this without any real knowledge of the Macbeth story, there will be long stretches where you don't entirely know what's happening. But, even in those moments where I had no clue what I was watching, I could not take my eyes off it. If every actor was born to play one specific character, Macbeth would belong to Michael Fassbender. He is impeccably cast in this role, and he delivers every word of dialogue with a multitude of emotions. Due to the vast majority of the dialogue remaining unaltered from Shakespeare's original play, there are frequent moments in this film where Macbeth (and/or his wife) speak aloud to themselves for long periods of time. But these soliloquies are handled expertly by Fassbender, creating a depth of emotional pain to his character but simultaneously keeping that hard edge that Macbeth as a man needs to thrive. Cotillard is equally as mesmerising, if not more so. Her elongated soliloquy, in which she discusses her guilt while washing imaginary blood from her hands, is a beautiful moment in an otherwise very dark film, and one of the finest pieces of acting I've seen all year. Whilst most soliloquies are delivered almost to the audience and not to any in-film presence, the reveal of who her dialogue is aimed at in just one cutaway holds the heaviest emotional impact this film offers. Cotillard's vulnerability in the role is obvious, but she is a commanding on screen presence in every scene she takes part in, and, for me at least, dominates this film. Is it still too early to discuss Oscar nominations? But, besides the dialogue and performances, what makes these soliloquies so utterly enthralling are the ways in which they are framed. Cinematographer Adam Arkapaw goes big for a lot of the film. The blockbuster scale action sequences are framed with a contrast of real time wide shots and slowed down midshots, and with such stunning scenery it's no wonder that the majority of the externally shot scenes are framed to incorporate as much of the background as possible. Yet when needs be, and when these heart wrenching soliloquies come, Arkapaw goes in for the rare close up. These sequences feel intimate, it feels as if we shouldn't be allowed to watch what we're watching. It gives both Macbeth and Lady Macbeth a ridiculously powerful sense of humanity, even amid all the evil they commit together. These moments feel, as they should, extremely personal. As Cotillard delivers her soliloquy mentioned earlier, the camera sticks in close up, static on her face until her dialogue ends. Rather than go big and loud for the film's heart - as one could very easily do with this story and these characters - Kurzel goes small and quiet. In a very loud and very bold film, it's these moments that are the most unforgettable. This isn't the only cinematography success, either. The repeated cutting between real time and slow motion for the battle sequences perfectly demonstrates how war combat is both intimate and horrific at the same time. The whole final act of the film is tinted with a blood red hue, with slowly lightens into an orange tinge following the battle's culmination. It's a startling effect, but one that further demonstrates just how stunning this film is visually. Ariel shots peering down from way above give us an almost voyeuristic look at this world from angles and perspectives we shouldn't be able to see it from. The witches are often shot front on, standing in a line and creepily staring directly forwards, with a horrifically eerie drumbeat soundtrack accompanying them. Macbeth's narrative does slow down in the middle act, but its beautiful cinematography and exquisite performances keep everything balanced. If this is your first time seeing the Macbeth story unfold, do not expect to always understand what you are watching. But this challenge is rewarding, this is an enthralling piece of cinema that doesn't dumb things down to appeal to the masses. Watch it once to come to terms with the story and to start knowing the characters. Watch it again to appreciate just how masterful it is. 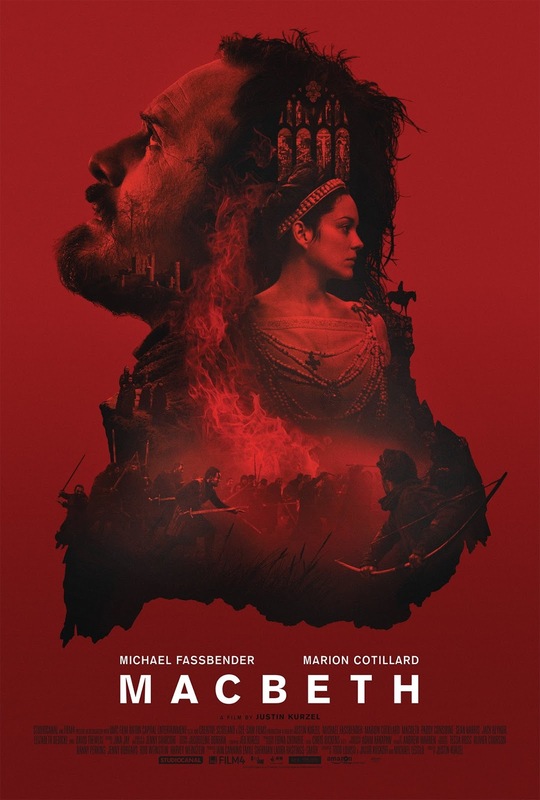 To Summarise: Despite its challenging narrative and dialogue, Macbeth excels as a superb Shakespeare adaptation due to its immaculate cinematography, expertly crafted direction and a breathtaking pair of performances from Michael Fassbender and Marion Cotillard.